(Newser) – About one in five Americans say they've peed in the pool. Even the world's most famous pool-user, Michael Phelps, says "everybody" does it. Now scientists have finally figured out a way to quantify just how much urine is in our pools, and the results in Environmental Science & Technology Letters probably won't please swimmers. A research team testing 31 pools and hot tubs in Canada found evidence of urine in every single one of them, Gizmodo reports. 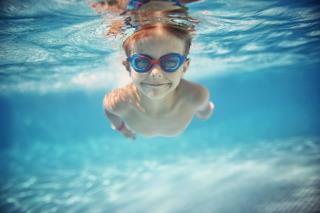 On average, there were 8 gallons of urine in a 110,000-gallon pool and 18.5 gallons of urine in a 220,000-gallon pool. According to the Guardian, the results were even grosser for hot tubs. One hotel hot tub was found to have three times the urine level of the worst swimming pool. Calcium hypochlorite chuckles at the 'scientific' chuckleheads. Pee, oh well...there was this woman who washed a baby's diaper.. I have a DE Filter that requires very few chemicals as long as no one pees in the pool. My wife and I are the only ones swimming in it 99% of the time, so it just never happens. I won't swim in a public pool. I saw one at a resort that was blue in the morning, and green in the late afternoon. Stay out of them.